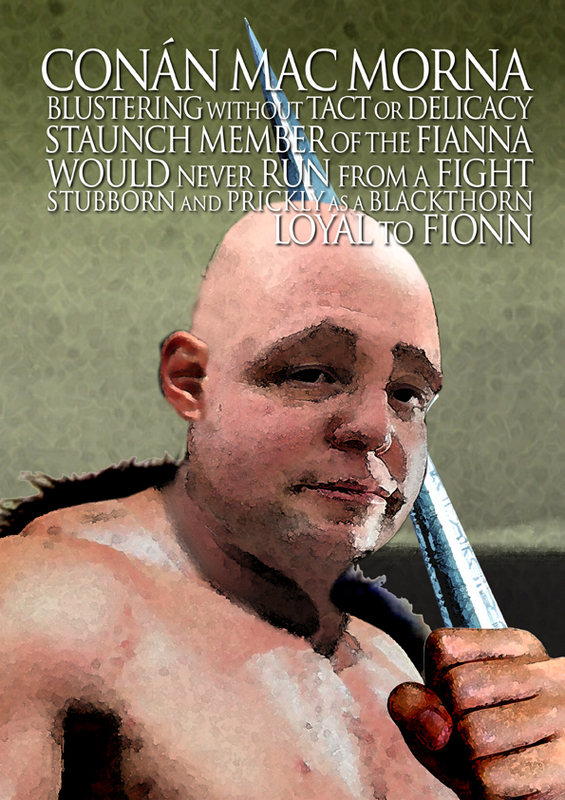 Conán is the brother of Goll Mac Morna, Fionn’s great rival in the Fianna. He was fondly nicknamed Conán Maol, for his bald head. He was also known as Mallachtán, which means insulter, as he often voiced how great he was, how deserving of respect and adulation, and how nobody else fared well by comparison. It is clear that throughout the years the Baoiscne Clan is painted in a better light than the Morna Clan, with members of the Morna clan often depicted as having some major character flaws. Conán is no different. He displays a great lack of tact and delicacy, often acting as a bit of a troublemaker within the Fianna, cutting quite a comical buffoonish figure at times with his blustering ways. He is fat, greedy, and ostensibly favours the members of the Morna clan. He is, however, very loyal to Fionn, and will never run from a fight. In fact, within the Fianna he is most valued for his quarrelsome nature. They appreciated that he was always first into the fray of any fight. He never held back in defence of any of his brother, though they may be from the Baoiscne clan. At one point, Fionn suggested that he should take the blackthorn as his totem plant, as the uncompromising, stubborn and prickly nature of the plant resembled his nature, but that occasionally it could blossom with masses of pure white flowers, brightening the entire plant. There was a great feeling of tolerance towards his behaviour among the Fianna, as they all understood that it was just his way, and that he meant nothing by it. On one occasion, when out hunting, the Fianna sought shelter in a cave. They slept well, but each man woke to find that they had been put under a spell, and that they were stuck to the ground. Caílte, who had spent the night running with animals, came to the cave and found them in this state. He released them by pouring magical water between their skin and the ground. Unfortunately, by the time he arrived at Conán, the water had run out. Fionn and Goll caught Conán by his wrists and heaved him off the ground with all their strength. As he was released from the ground Conán let out a big roar, as all of the skin on his back was torn off him. The Fianna laid him down, killed a sheep, skinned it, and pressed the raw hide to Conán’s back. This succeeded in replacing his lost skin. The Fianna sheared his back regularly, and the black glossy curls of his back were used to make a new jacket and trousers for his each year. Having to suffer this indignity is one explanation for his ready temper, and for his need to bolster up his position within the Fianna. Conán is a bit of a diamond in the rough. He is lucky that he is well understood by the members of the Fianna. His brothers know to take his roughness in good nature, as they know that beneath that bluster and the insults lies a true-hearted member of their tribe. He will always end up with his foot in his mouth, however, and when his protests at his own greatness go too far, he is often brought down to earth by one of the others. He can be misunderstood by people who don’t know him that well.